Ayodhya (Hindi: अयोध्या, Urdu: ایودھیا, IAST Ayodhyā), an ancient city of India, holds a cherished place in the faith of Hindus, Jains, Buddhists and Muslims. The Ramayana, a Hindu classic, portrays the splendor of the city, the virtues of the monarchs, and the loyalty and prosperity of the people. Hindus traditionally believe that Ayodhya had been the birthplace of Lord Ram, at Ram Janmabhoomi, the site of the demolished Babri Mosque. With the rise of the Gupta Empire (320 to 550 C.E. ), Hinduism again ascended in Ayodhya, entering a golden age. 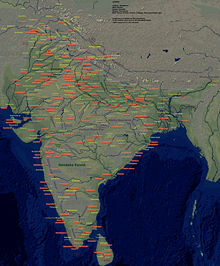 The Gupta Empire covered northern India, Afghanistan, Bangladesh, and Tibet. For Jainism, Ayodhya is sacred place because Jain scripture relates that five Tirthankars, including the founder of Jainism and the first Tirthankar, Shri Rishabh Dev, lived in Ayodhya. For Buddhists, Ayodhya holds a special place as a center for Buddhism during the Mauryan Empire (322–185 B.C.E.). Ashoka the Great had been the great promoter of Buddhism, expanding the Mauryan Empire to cover nearly all of the territory of present day India. At the peak of his empire-building, Ashoka renounced war and converted to Buddhism, declaring Buddhism as the empire's religion and establishing Buddhist temples throughout. Ayodhya became one of the centers of Buddhism during his reign. The history of Islam in Adodhya began with the invasions by the Ghaznavid Empire (975 to 1187 C.E.) and the Ghorid Empire (1148-1215 C.E.). In the 1500s, Islam became firmly established, demolishing Hindu, Buddhist, and Jain temples while building mosques. One case, in particular, has become a flash point in Hindu-Moslem relations, the destruction of the Babri Mosque which had been built on the spot Hindus traditionally revered as the birth place of Rama. In 1992, Hindus destroyed the Babri Mosque, using the event as a rallying call for Hinduism to reclaim its primacy over Islam in India. Ayodhya stands as an ancient testimony of India's multi-religious fabric. The peaceful working out of dispute over holy places in Ayodhya represents an opportunity to create a harmonious religious atmosphere in India among Hindus, Jains, Buddhists, Moslems, and Christians. The conflict may be best resolved by approaching the dispute in the spirit of Mahatma Ghandi. This Hindu holy city, described as early as in the Hindu Epics, had been called Ayojjhā (Pali) during the time of Gautama Buddha. Under the British Raj the city and the administrative area around it went by the name Oudh. Situated on the right bank of the river Sarayu, Ayodhya lay 555 kilometers east of New Delhi. In Sanskrit, ayodhya means "not to be warred against." Some Puranas like the Brahmanda Purana (4/40/91) consider Ayodhya as one of the six holiest cities in Hinduism. In the first few centuries of the Common Era, Ayodhya had the name Śāketa. The great Kushan/Yuezhi Emperor Kanishka Śāketa, or 沙奇 (Pinyin: Shāqí), who made it the administrative center of his eastern territories, conquered the city in c. 127 C.E. The name occurs again in Faxian as 沙祗 (Pinyin: Shāzhī) in the early fifth century. When the name changed remains unclear, but by the time of the visit of the Chinese pilgrim monk, Xuanzang, c. 636 C.E., the city had the name Ayodhya. Rama welcomed back to Ayodhya. Ayodhya had been one of the most ancient, largest and most magnificent of Indian cities, covering an area of 250 km² (96 square miles). The city served as the capital of the Hindu kingdom of Kosala (Kaushal), the court of the great king Dasaratha, the 63rd monarch of the Solar line in descent from Vivaswan or the Sun God. The son of Vivaswan "Viavswat Manu" founded the city of Ayodhya. 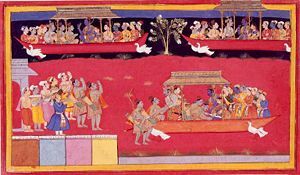 The opening chapters of the Ramayana, a mythological religious epic of the Classical Hindu period, recount the magnificence of the city, the glories of the monarch and the virtues, wealth and loyalty of his people. Dasaratha, the father of Rama, had been the Seventh Avatar of the Vishnu. Many Hindus believe that Ram Janmabhoomi, the site of the demolished Babri Mosque, had been the birthplace of Rama. According to the Ramayana, the House of Ikshvaku, the son of Manu, ruled Ayodhya. Eventually, Rama ruled Ayodhya. Ayodhya also served as the birth place of five Tirthankars, including the first Tirthankar of Jainism, Shri Rishabh Dev, known as the father of Jain religion. The city displays evidence of its importance in the history and heritage of Buddhism in India, with several Buddhist temples, monuments and centers of learning having been established here during the age of the Mauryan Empire and the Gupta Dynasty. Ayodhya reached the peak of its golden age during the reign of the Guptas over India. Bhagwan Swaminarayan, founder of the Swaminarayan Sect of Hinduism, lived here during his childhood years. Bhagwan Swaminarayan started his seven year journey across India as Neelkanth in Ayodhya. Tulsidas began to write his famous Ramayana poem Shri Ramacharitamanas in Ayodhya in 1574 C.E. Several Tamil Alwar mention the city of Ayodhya. Ayodhya had been the birthplace of Bhahubali, Brahmi, Sundari, King Dasaratha, Acharya Padaliptasurisvarji, King Harishchandra, Shri Rama, Achalbhrata, and the ninth Gandhara of Mahavir Swami. The Atharva Veda called Ayodhya "a city built by gods and being as prosperous as paradise itself." Ayodhya had been the victim of pillage and sacking during the Ghaznavid raids and Ghorid invasions. Some Hindu temples had been looted and destroyed. Some believe that the Babri Mosque had been constructed on the remains of a temple, but that claim remains controversial. With Muslim rulers established around the city under Mohammed of Ghor, it lost its strategic and economic importance to Lucknow and Kanpur. According to an eleventh century Korean chronicle the Samguk Yusa, the wife of King Suro of the ancient Korean kingdom of Geumgwan Gaya had been a princess who traveled by boat from a faraway land called Ayuta to Korea in 48 C.E. The common view has been that the Korean chronicles refer to Ayodha, but some scholars believe that the foreign land may have been Ayutthaya of Thailand. The Koreans know the princess as Heo Hwang-ok, the first queen of Geumgwan Gaya considered an ancestor by several Korean lineages. Ayodhya serves as the center of the Ayodhya Debate concerning the Ram Janmabhoomi temple and the Babri Mosque. The first Mughal emperor of India, Babur, constructed the Babri Mosque in Ayodhya in the sixteenth century. The mosque took on the name Masjid-i Janmasthan ("mosque of the birthplace") before the 1940s. The mosque stood on the Ramkot ("Rama's fort") hill (also called Janamsthan ("birthplace"). According Hindus scholars, it had been built on the birthplace of the deity Rama after the Mughal rulers demolished the Ram Mandir ("Temple of Rama") on its location as they had done to many other temples around India. Hindu activists, in turn, destroyed the mosque in a riot on December 6, 1992. According to that view, the ancient temple could have been destroyed on the orders of Mughal emperor Babur. Thousands of Hindu temples had been destroyed by Islamic invaders for both political and religious reasons. No surviving temple structure in the ancient and holy Hindu places of Varanasi and Mathura date prior to the seventeenth century. The Hindu Nationalist movement has been pressing for reclaiming three of its most holy sites which had been suffered sacrilege at the hands of Islam—at Ayodhya, Mathura, and Varanasi. On the other hand, some argue that although the judiciary has been debating on the dispute of Babri Masjid (mosque) in Ayodhya for more than 40 years, and that it had remained a non-issue until the mid-1980s. A legal case continues over who owns the title for deed of the a government controlled property. While the Muslim parties have agreed to hand over the land (not unlike the Masjid Shahidganj case in Lahore where the Sikhs) received the Gurudwara if proven that the Ramjanmbhumi (that is, Ram was born on this site) temple existed. The Hindu side wants Parliament to pass a law mandating construction of the Hindu temple, arguing a court of law can not decide an issue of faith concerning the existence of Ram Janmabhoomi. Nobel Laureate V. S. Naipaul praised Hindu Nationalists for "reclaiming India's Hindu heritage." He further added that the destruction of Babri mosque had been an act of historical balancing and the repatriation of the Ramjanmabhoomi had been a "welcome sign that Hindu pride was re-asserting itself." Kar Sevaks and rioters destroyed the mosque in 1992 spurned by the belief that the Ram Janmabhoomi existed prior to the mosque's construction and that the temple had been the birthplace of Rama. The title suit on the disputed site awaits, pending, in the Lucknow Bench of Allahabad High Court. On July 5, 2005, five militants attacked the site of the makeshift Ramlalla temple, in Ayodhya. Security forces guarding the area shot all five in the ensuing gunfight, and one civilian died in the bomb blast triggered by the terrorists to breach the cordon wall. The claim of police that the militants came from Pakistan remains uncorroborated by independent evidence. The reason for the attack remains a mystery. Ayodhya today exists as a small, rustic city with ancient Hindu architecture predominating, and with some Mughal influence. 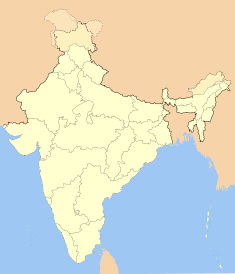 Its population, mostly Hindu, has a minority of Muslims, Jains and Buddhists. Its history and heritage hold an unequivocal importance for over Hindus in India and across the world. The Thai kingdom and city of Ayutthaya may have been named for Ayodhya, reflecting the common Southeast Asian practice of adopting place names from Hindu kingdoms. Countertenor Michael Chance as Ganesha in Somtow's opera "Ayodhya"
↑ Bharatadesam, Ayodhya. Retrieved September 15, 2008. ↑ John E. Hill, The Peoples of the West from the Weilüe 魏略 by Yu Huan 魚豢: A Third Century Chinese Account Composed between 239 and 265 C.E. Draft annotated English translation, Weilue. Retrieved July 31, 2008. ↑ Sarina Singh, India (Footscray, Vic: Lonely Planet Publications, 2005), 382. ↑ Voice of Dharma, Legacy of Muslim Rule in India. Retrieved July 31, 2008. ↑ Christian Scientist Monitor. Retrieved July 31, 2008. ↑ Times of India, Lessons for Ayodhya from Lahore gurdwara. Retrieved July 31, 2008. ↑ Times of India, Obeying court orders only course open: Muslim board. Retrieved July 31, 2008. ↑ V.S. Naipaul, Beyond Belief: Islamic Excursions Among the Converted Peoples (New York: Random House, 1998). ↑ Outlook India. Retrieved July 31, 2008. ↑ V. S. Naipaul, India: A Million Mutinies Now (New York, NY: Penguin Books, 1992). Elst, Koenraad.Ayodhya: The Case Against the Temple. 2002. ISBN 8185990751. Emmanuel, Dominic. "The Mumbai bomb blasts and the Ayodhya tangle." National Catholic Reporter (Kansas City, August 27 2003). Legge, James. A Record of Buddhistic Kingdoms: Being an Account by the Chinese Monk Fa-Hien of his Travels in India and Ceylon (A.D. 399-414) in Search of the Buddhist Books of Discipline. New York: Paragon Book Reprint Corp., 1965. ISBN 9780486267609. Mandal, D., and Shereen Ratnagar. Ayodhya: Archaeology After Excavation. New Delhi: Tulika Books, 2007. ISBN 9788189487317. Naipaul, V. S. India: A Million Mutinies Now. New York: Penguin Books, 1992. ISBN 9780140156805. Naipaul, V. S. Beyond Belief: Islamic Excursions Among the Converted Peoples. New York: Random House, 1998. ISBN 9780375501180. Narain, Harsh. The Ayodhya Temple Mosque Dispute: Focus on Muslim Sources. Delhi: Penman Publishers, 1993. Irani, Cushrow. Ayodhya, demolishing a dream. New Delhi: UBPSD, 2004. ISBN 9788174764751. Singh, Sarina. India. Footscray, Vic: Lonely Planet Publications, 2005. ISBN 9781740596947. Thomas, F. W. “Sandanes, Nahapāna, Caṣṭana and Kaniṣka: Tung-li P’an-ch’i and Chinese Turkestan.” New Indian antiquary. 1938. Bombay: Karnatak Publishing House. Ayojjhaa - Buddhist Dictionary of Pali Proper Names. This page was last modified on 8 December 2016, at 23:51.